One of the fastest growing and complex areas of GRP production, pultrusion is a sophisticated highly capital intensive process for the continuous volume manufacture of close dimensioned profiles. Continuous reinforcements pre impregnated with resin by dip bath or injection are pulled through a heated die to cure to a strong, rigid section. Internal release agents are exclusively used and CRC are the market leader in supplying this technically demanding industry with a range of products for different resin matrices and final product requirements. Another capital intensive process which is the winding of continuous resin impregnated reinforced fibres around a cylindrical former. Mainly for the production of pressure vessels, tubes and tanks because of the high hoop stress, which is often enhanced by cross winding at different angles. This process utilises low to medium cost matched male and female tooling. Resin is either injected into the closed mould void pre filled with reinforcement, often with vacuum (RTM) or introduced prior to mould closure (cold press). Good productivity is achieved with CRC IMR grades specially formulated for gel coat and bulk resin allowing long runs between mould maintenance and consistent finish. Post mould operations such as painting and adhesive bonding are not affected. Marbocote external release compliments the IMR system perfectly in this application. Contact moulding is highly labour intensive. 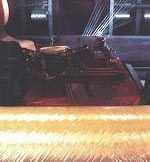 Reinforcing materials are applied as a mat or chopped glass fibres into a pre-catalyst resin matrix in an open mould which is normally gel coated. This is then consolidated and de-aired by hand. Moulds are normally wax coated. IMR’s are used with both gel coated and non gel coated mouldings to enhance external release agent performance and therefore increase productivity. We offer low cost solvent synthetic wax and flurocarbon external release agents as well as water based emulsions. Marbocote semi-permanent systems are increasingly replacing conventional external release agents.